Also blocks access to the bike racks on platform 10. Yeah, I also found it odd that some ticket machines were left behind the new gatelines at King's Cross, but now one has been shifted to a more sensible place (i.e. 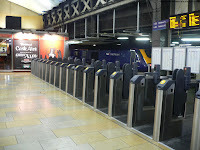 not in the paid-area) while the other has been removed altogether and replaced by two new machines. Apparently they weren't moved straight away because the wires connecting them were effectively under the platform track bed so an engineering possession of the lines into those platforms was required. "The footbridge has to be outside the gated area because it provides a NW entrance into the station, via the central platforms - it may even be a public right of way..."
Surely you could add an extra gate and a ticket machine at the footbridge entrance, controlled from the same place as the [putative] HEx barriers that this plan would also require?